Dunbar and Boardman: Who built the First Magic Carpet ® Ski Lift? In our last post we told the story of the first ever solar-powered ski lift. If you missed that you can read it here. 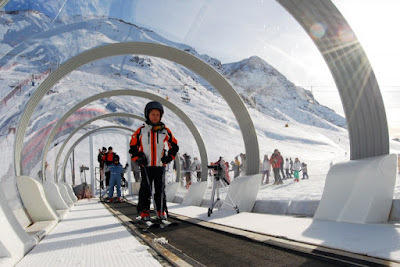 This week we are staying with the skiing theme because we have turned our attention to a ski resort conveyor belt vertical transportation systems known as a Magic Carpet. Magic Carpets are surface lifts, which are a form of cable transportation used by skiers and snowboarders. Riders of surface lifts remain on the ground and are pulled uphill. One of the earliest known surface lifts was invented in Truckee, California in 1910 and was initially called a Toboggan Tow. Toboggan Tows became known as Ski Tows and contributed massively to the increasing popularity of skiing throughout North America and Europe. Ski slopes were now accessible to more people. Rope Tows, T-Bars, J Bars and Platter Lifts followed Ski Tows; all of these are different variations of surface lifts. The first ever Magic Carpet lift was launched in 1990 in Denver, Colorado by a company called Rocky Mountain Conveyor & Equipment (RMCE). Founded by Dave Kelly the company has since changed its name to Magic Carpet Lifts. Similar to its predecessors mentioned above the Magic Carpet is a surface lift. Compared to ski tow devices Magic Carpet lifts are considered more user friendly and therefore ideal for novice skiers and children. It is because of this they are often deployed in beginner and novice areas. Magic Carpets are conveyor belts at the level of the snow. Some constructions include tunnels. Passengers position their skis or snowboard facing forward, and then the moving belt pulls the passengers uphill. At the top the Magic Carpet pushes the passengers onto the snow and they slide away. Magic Carpets move at a slow speed and can only be uses over a limited distance. Gondola lifts or chairlifts are now more commonly installed in more advanced ski areas. What are the benefits of Magic Carpets? * Modular construction means that height and length can be modified to fit the installation. Since its first installation in 1990 Magic Carpets Lifts have installed well over 300 Magic carpets in eight countries around the world. They have expanded beyond the winter sports market and have also completed installations at water parks and theme parks. Carpet Houston are wonderful for living rooms, bedrooms, and most other indoor spaces that are usually fitted with cozy flooring. Buy our carpets with High Quality stair carpet in Dubai, Abu Dhabi & Across UAE at fast installation service with best price . CALL NOW 0566-00-9626. Topsufaceuae is Premium Cheap Cost Rubber Flooring flooring Supplier, Installer in Dubai UAE. High Quality Rubber Flooring flooring Dealer at low cost. Best Gym Flooring, Artificial Turf Supplier, Installer in Dubai, UAE. This is awesome and best blog. Thanks for sharing. keep it up.